Bad: The story is not that interesting, and the characters are cliche and forgettable. Metal Max Xeno is sixth game in the Metal Max series, all JRPGs set in a desolate post-apocalyptic wasteland. Of this series, only two games have been translated to English (not counting fan translations), and the last one was released in 2006 for the PlayStation 2. The Metal Max games are all open world RPGs with turn-based combat, where you’ll be able to fight both on foot as in a vehicle. In the distant future, humanity is mostly extinct. There are a few survivor camps scattered around, but even these are being eliminated by murderous machines. You are one of the few humans left, and the very last monster hunter. Your mother got killed by the machines, and the man who has acted as your mentor, taught you how to use tanks and get around in the world. As you travel through a desert, looking for an encampment of survivors, you encounter a small group of people living in a futuristic looking bunker. They tell you the destruction of humanity was brought about by an AI which was designed to help battle climate change, but decided that humanity is the biggest danger to the planet, an thus eliminated mankind with the help of machines. As you go on, you’ll discover more survivors, which you can add to your team of hunters. The further you progress in the game, the more you learn about the world around you, how it looked before the apocalypse, and what exactly happened. 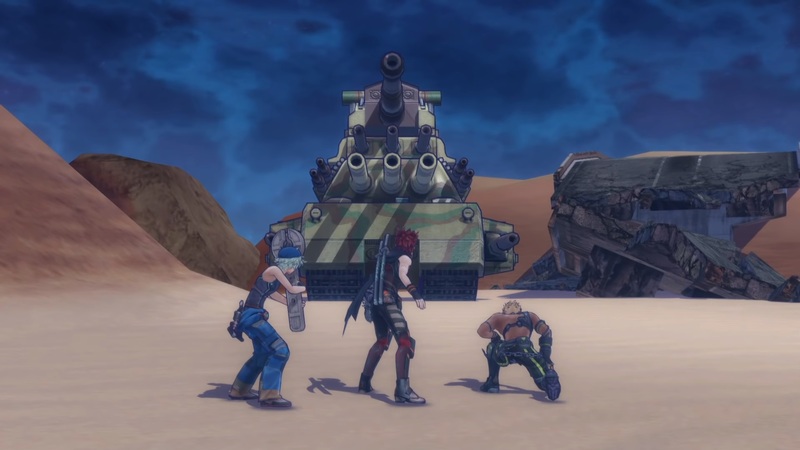 Metal Max Xeno is part of a series, but can be played as a stand-alone story. The story is told in-between battles, mostly in dialogue with the other characters, but sometimes via flashbacks of the main character. There are several characters which the main character will learn to know, all with their own background stories. It’s fun to discover new characters and learn about their stories, but the story in general is not that compelling. The graphics are colorful, in a cel-shaded anime style, but look a bit simplistic and dated. However, the character designs are pretty cool! All conversation is accompanied by an 2D avatar of the person talking, showing their emotion, while the 3D character is animated as well. The world you’ll drive around in is a typical post-apocalyptic wasteland, consisting mostly of stretched out plains of sand with scattered ruins you’ll be able to explore on foot. The environment feels desolate, but is a bit boring as well, after driving around in it for a while. Different areas have their own separate soundtrack, usually pretty energetic music. Of course, there’s battle music as well, which is extra energetic! While the game is English, all characters’ voices are in Japanese. The conversations are all narrated. 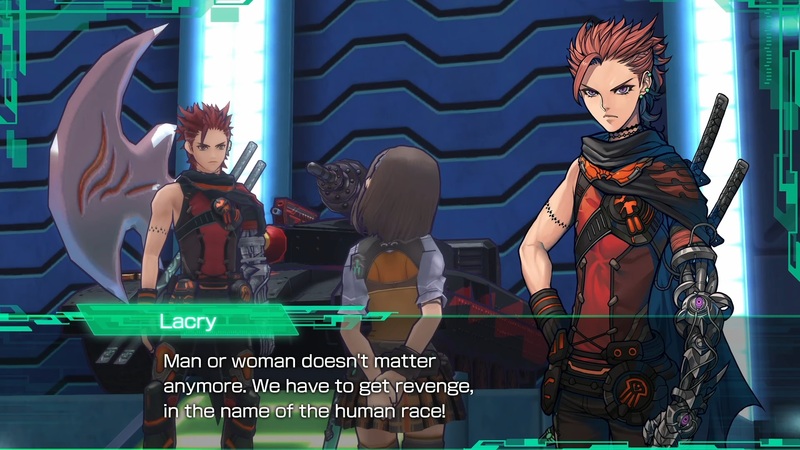 Metal Max Xeno is a JRPG with turn-based combat with a twist. There are two different modes you’ll use to travel around the world: either in a tank, or on foot. You’ll quickly learn you’ll be able to take on pretty tough enemies in a tank (mostly machines), while on foot you should keep away from most enemies, except ones that look like critters. But all characters joining your team will have their own tank to fight with! 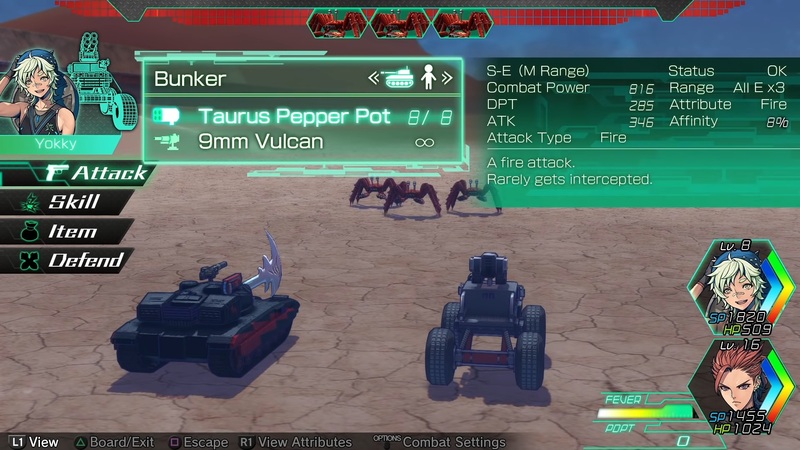 You’ll be able to use different skills and attacks when on foot, compared to fighting in the tanks. From the tank, you’ll only be able to use the tank’s weaponry. Luckily, that is just as easy to swap out as gear on a person. You can even craft new parts using the materials you find from looting crates or enemies, and you’ll be able to upgrade your crafting skill to craft better parts. Combat is turn-based, just like any typical JRPG you’ll choose your attacks, skills, items etc. from menus you’ll skip through to find the right move for the situation. However, all the attacks are executed all at once, so sometimes you’ll be wasting you attacks on an enemy that already died from the previous attack. While driving through the desert with your tank, you are actually pretty strong! As soon as your tank detects an enemy, you’ll get a proximity warning, and the option to shoot. This will kill most weaker enemies, and with strong enemies, this will induce a battle. However, you also get the option to just drive around the enemy, since you’ll encounter them pretty often, and you ammo isn’t limitless. You’ll need to return back to base pretty often to fix up your tank and refill ammo, but luckily, you’ll come across teleportation points pretty often, so you can continue your exploration of the map, and the search for survivors. As you travel the ruins of Dystokio, you will often encounter places where your tanks can’t go, so you’ll have to travel on foot. Sometimes it’s just exploring to find crates in the overworld, but often you’ll enter a dungeon in an abandoned building, and then you’ll need to fight. Encounters happen very often, and on foot you are pretty weak. You need a lot of items and good gear to explore, or you’ll need to return often to heal up! Dungeons do take quite a long while to play through this way. Combat on foot is pretty much similar than combat in a tank, but with different weapons and skills. However, you won’t get a preemptive shot, sadly. Exploring dungeons will give you some awesome loot, so it’s worth the risk. Because you’ll collect gear for both your characters as for your tanks, the customization options are endless! Especially modifying the tanks is pretty interesting. You’ll need to choose a body and an engine for your tank, and later in the game, you can add mods as well for special capabilities. 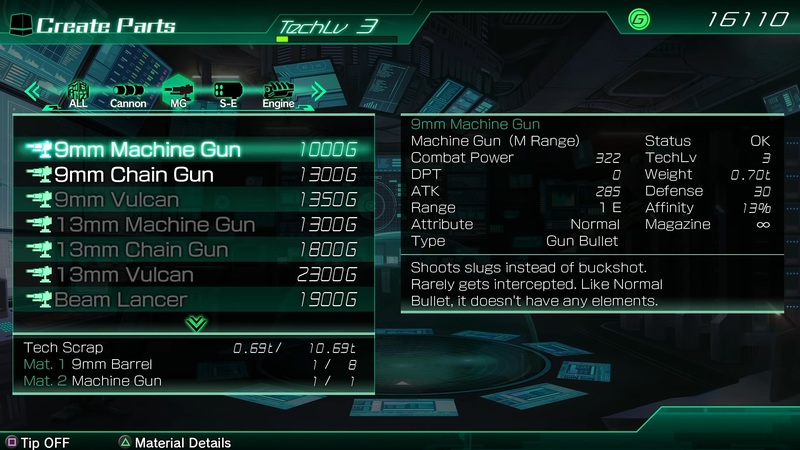 There are not one, but multiple weapons slots on a tank! There are so many guns to choose from, so you can pick pretty much whatever you like and what fits your playstyle, but you’ll need to balance that out with the other gear on your tank. Also, some weapons look very cool! 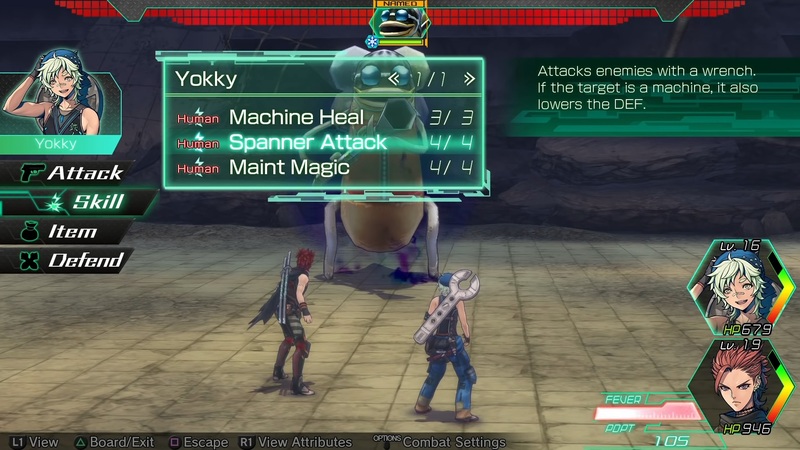 For instance, one of the first bosses you’ll encounter drops a giant blade for your tank! At the start of the game you’ll be free to experiment with gear without much consequences, but later in the game you’ll really need to think about how you equip your tank, or you won’t be able to win the battles against the tougher enemies. There is also plenty of gear for your characters to equip, including three different weapons. You can even change the class of any of your team members (even yourself) if you’d like to. You can travel around with only two other characters, so you’ll need to try and build a balanced team. The game is fine for a typical JRPG, but it’s not a ‘must play’ title. The idea of travelling around and fighting in a tank is pretty cool, but it doesn’t add that much depth. The customization options for the tank are pretty cool, though. The story isn’t all that interesting, and the characters don’t really add much interest. The game seems easy at the beginning as long as you are in your tank, but further in the game it’ll become more challenging.